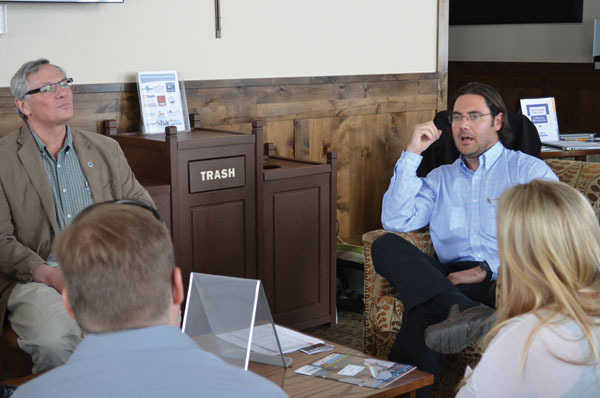 More than 30 small-business owners from throughout Summit County gathered at the Frisco Adventure Park Great Room yesterday to hear presentations from and speak with representatives of various small-business resources at local, state and federal levels. Among these were the Small Business Development Center, Small Business Administration (SBA), the towns of Dillon, Frisco, Silverthorne and Breckenridge, Colorado Workforce, the Summit Independent Business Alliance (SIBA), Breckenridge Resort Chamber, Colorado Mountain College, Firstbank and U.S. Bank. “It’s really amazing that under one roof that a small business can come here for an hour and a half and be able to have access to so many resources and to really network with those resources and to be able to sit down with them and have an earnest discussion, and that’s where I think the value is,” said Lindsey Stapay, with the Small Business Development Center at Colorado Mountain College. Anything and everything related to small business was on the table for discussion. After introducing themselves, representatives from the above groups rotated among tables of participants. At each mini-session, representatives explained what they could do to help small businesses and then fielded specific questions from business owners. Topics ranged from the strategic side of business plans and marketing to the money side of interest rates and bank and federal loans. The Small Business Administration (SBA), an independent agency of the federal government, offers various resources to small businesses, including counseling and training services and a number of loan guaranty programs. Taylor Marshall, economic development specialist with the SBA, was on hand to describe the options available that participants might not have known about. For example, the SBA offers a disaster loan program, which covers events such as drought, a condition for which Summit County qualifies. That means that a local business that has been economically hurt by drought could potentially qualify for money from SBA. Bank representatives were also on hand to discuss what they were doing to help small businesses. “I think that my main mission today was to educate small businesses on ways to get funding and educate them on banking as a whole and let them know that we’re out lending money, we want to lend money,” said Justin Slezak, assistant relationship manager at U.S. Bank. Slezak explained that the “relationship” part of his job title explained what he and his colleagues do very well. He said he often holds quarterly meetings with business owners to keep up on what they’re doing and advise them on next steps. Larry Stone, a local CPA, confirmed Slezak’s “relationship” approach. “The more your banker knows and understands your business, the more he can help you,” he said. Slezak was also there to put a face to the bank and to the voice over the phone. “If you talked with U.S. Bank, you’d probably be talking with me about it,” he told one business owner after answering her question. Response from the business owners at the event was mainly positive. She also said she liked the one-on-one aspect because now she knows who to refer clients to with their various questions. “Now I can say, here, you need to call Lindsey, because she can help you,” she said. Imane Deininger, owner of Bookbreck Vacation Homes in Breckenridge, said that the event was very helpful. Chad Most, revenue specialist for the town of Frisco, said he was pleased with the event and considers it a success.